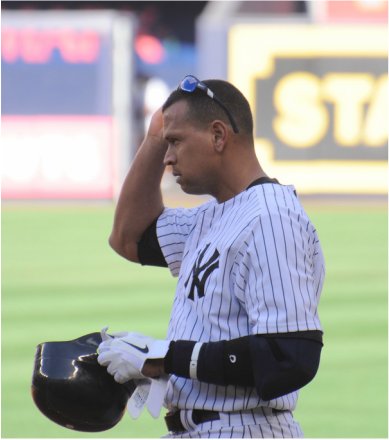 Alex Rodriguez is far from a role model. He went to strip clubs. He was a misogynist. And he used performance-enhancing drugs. So, in an attempt — he said — to atone for his sins, he teamed up with the Taylor Hooton Foundation in 2009. Taylor Hooton was a 17-year-old high school student in Texas, trying to make the baseball team. He was told he needed to bulk up, so he resorted to anabolic steroids. He suffered from depression and later committed suicide. Professional athletes who use performance-enhancing drugs get a slap on the wrist: a fine or a suspension. But stories like Hooton’s are far more serious than an athlete’s fall from glory. The Taylor Hooton Foundation focuses on drug awareness and informing people of the dangers of using them. After Rodriguez admitted his PED use in 2009 — calling it a youthful error in judgment and claiming he only used drugs for a three-year period from 2001-03 — he teamed up with the Taylor Hooton Foundation. It seemed like a perfect marriage: A former steroid user who had seen the dangers of using was now telling others to steer clear. Rodriguez, who was going to be a role model and spokesperson against these types of drugs, stood for something when he partnered with the foundation. "Since we began talking to him," the 2009 statement read, "we have found his sense of regret is genuine and his commitment to help is strong.”Except it wasn't real. Rodriguez allegedly continued using performance-enhancing drugs, even as he was preaching against their dangers with the Taylor Hooton Foundation. Now he's facing a 211-game suspension. Not just for the drugs he allegedly received and used, but for his alleged obstruction of baseball's investigation into the matter. Tellingly, he hasn't denied using PEDs. His appeal is against the punishment. And that’s where he failed everyone ... himself, his fans and — especially — the Taylor Hooton Foundation. "Today’s announcement leaves us no option but to discontinue our relationship with Alex Rodriguez," Don Hooton, Taylor's father and the president of the foundation, said in a statement on Monday. Rodriguez's baseball reputation is shattered. His chances at being enshrined in Cooperstown badly hurt. But for the moment, forget about Alex Rodriguez the baseball player and focus on Alex Rodriguez the person. It appears he wasn’t genuine when he teamed up with the Taylor Hooton Foundation. And it appears, he wasn’t genuine about preventing drug use across the country. “It is simply not acceptable for the foundation to be delivering positive education messages to kids in partnership with an athlete who has continued to use performance enhancing drugs in violation of the rules of Major League Baseball and in direct opposition to the lessons that we teach children,” said Neil Romano, chairman of the Taylor Hooton Foundation. The bullet that stands out is the third one. Values. Integrity. Ethics. Character. Leadership. Respect. Right now, none of those traits describe Alex Rodriguez. Read the story on the Comcast SportsNet New England's website here.